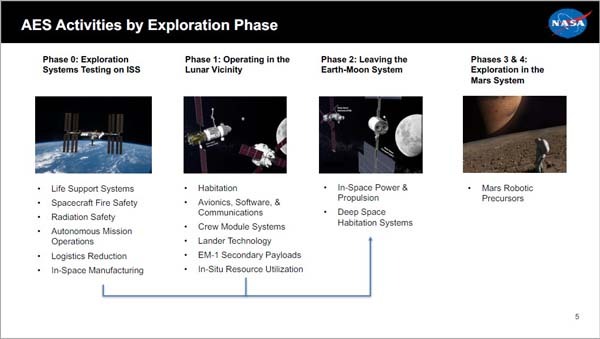 NASA’s planning is divided into three phases, beginning with the testing of life support and other systems on the International Space Station and continuing with operations in cislunar space. The final stage involves the exploration of Mars. 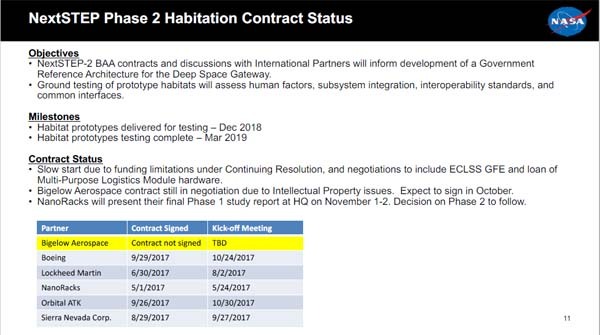 NASA’s NextSTEP program has begun to lay the groundwork for deep-space exploration with a series of contracts examining concepts for habitats to be used in conjuction with the Orion spacecraft. The habitat module would be part of a proposed Deep Space Gateway that would operate in cis-lunar space. 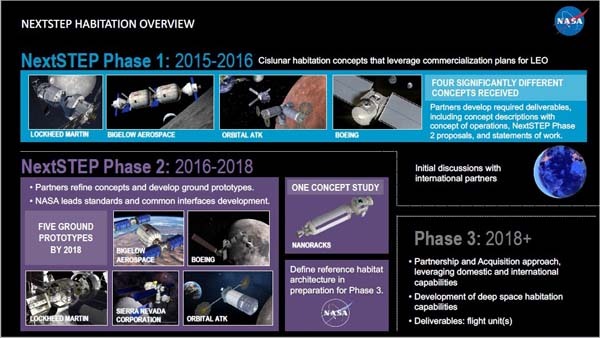 NASA is talking to nations who are already partners in the International Space Station about these plans. 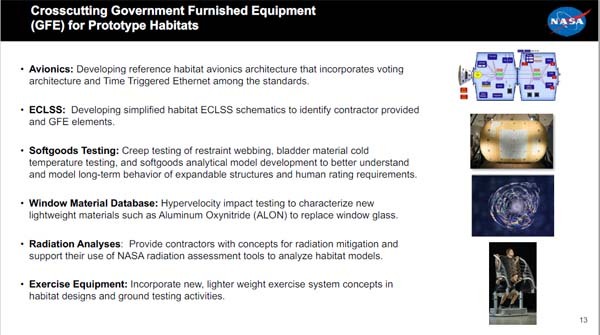 The government is providing a number of technologies for the prototype habitats the companies are building. The space agency is also exploring propulsion and power options to support its deep-space exploration plans. 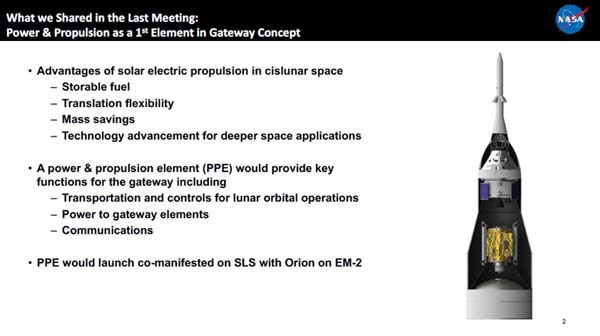 The PPE module would be the first element of the Deep Space Gateway. NASA has let five study contracts to industry. 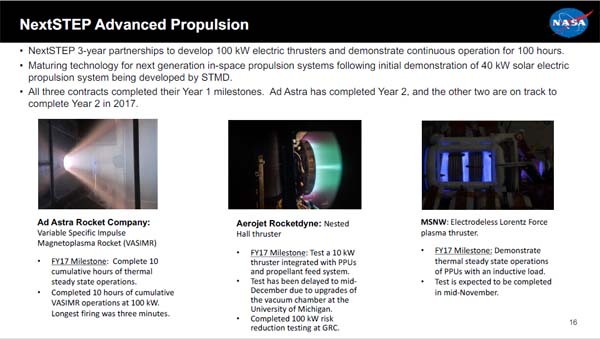 NextSTEP is funding advanced electric thruster development. 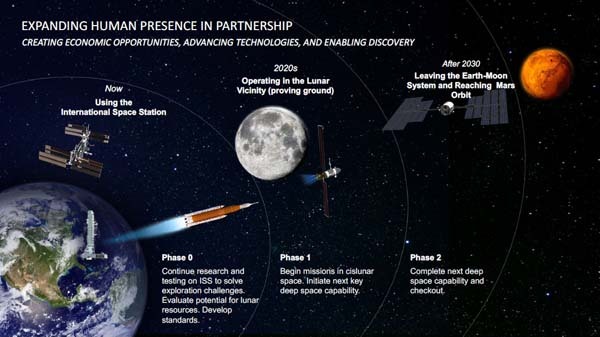 The space agency hopes that public-private partnerships will significantly reduce the cost of these efforts. 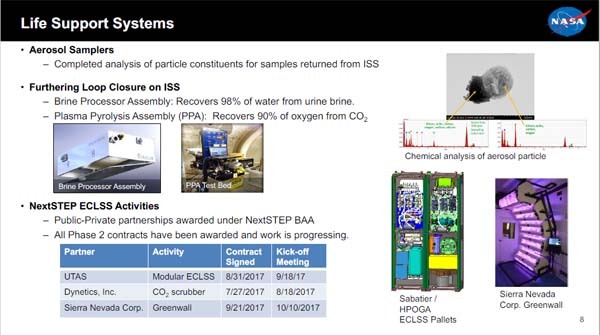 The NextSTEP program includes several efforts to developed advanced environmental control and life support systems (ECLSS). 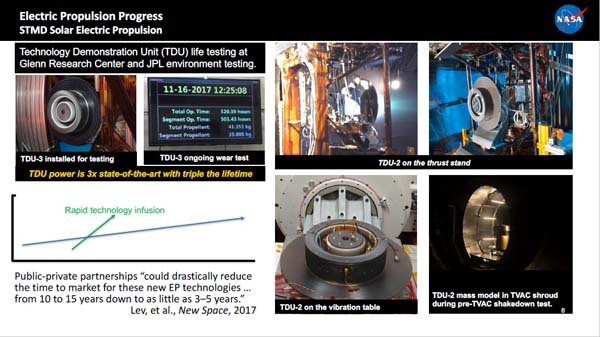 Advanced in-space manufacturing, which has already begun on the International Space Station (ISS), is also being pursued. 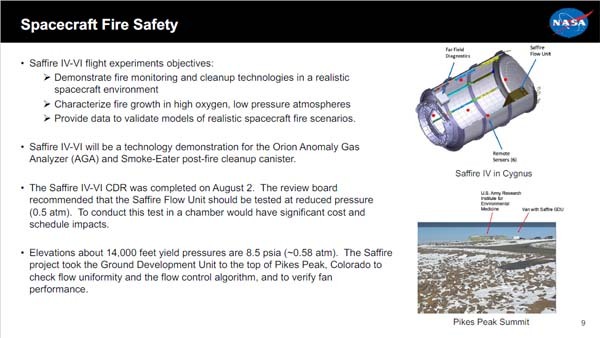 A series of spacecraft fire safety experiments known as Saffire has been conducted aboard Cygnus resupply ships after they left ISS. 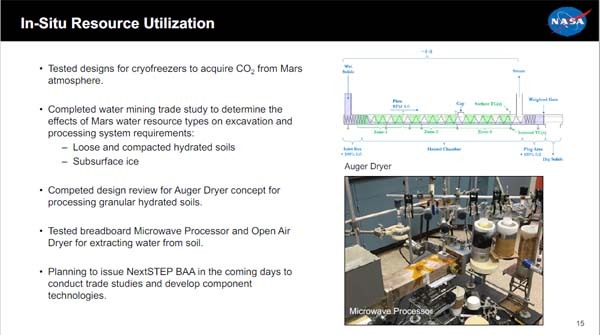 The space agency is also exploring the use of in-situ resources to reduce the cost of shipping materials up from Earth. 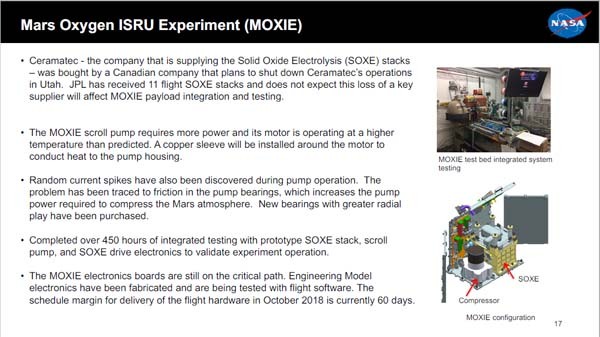 One experiment known as MOXIE, which seeks to produce oxygen from the martian atmosphere, is scheduled to launch aboard NASA’s Mars 2020 rover. 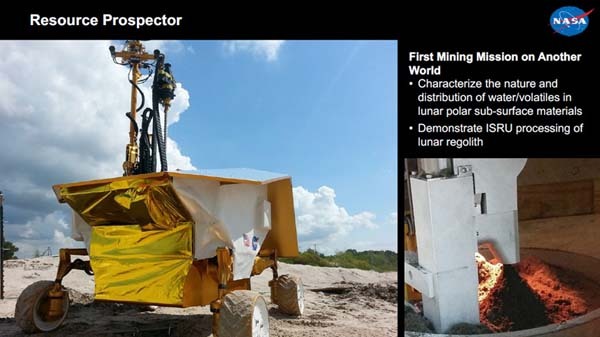 NASA is also developing the Resource Prospector mission to conduct the first mining operations on another world. 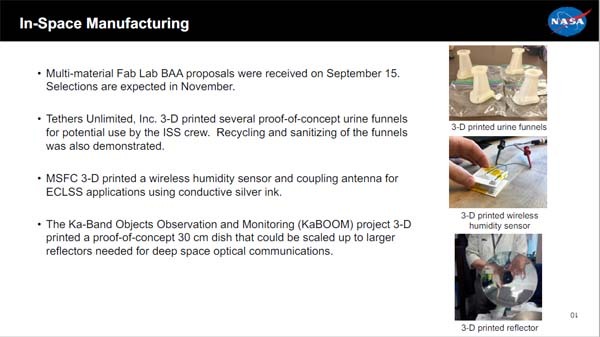 The rover will search for lunar volatiles and demonstration ISRU processing of lunar regolith. 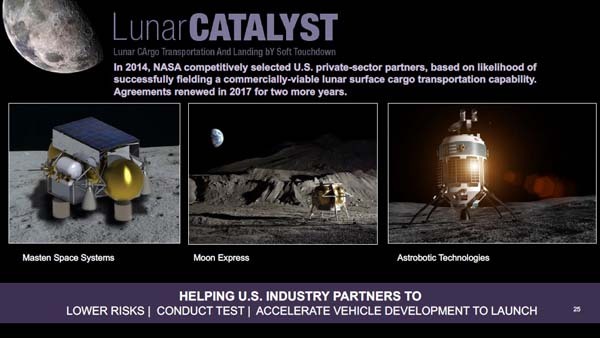 Another aspect of NASA’s deep-space planning is Lunar CATALYST, a program under which it is working with three companies that want to deliver experiments and payloads to the lunar surface. 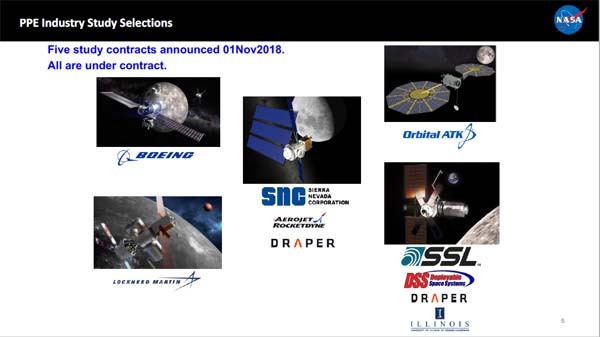 The Lunar CATALYST contracts have been extended by two years with expectations that the landers will be flying in 2018 to 2020. The preceding is merely a sampling of presentations delivered last month. To learn more, you can download the complete PowerPoint presentations here. Yes, the sure make a lot of pretty slides showing all the studies they are doing. Microsoft Powerpoint sees your trying to develop a vaporware deep-space exportation program, would you like to use a template? I realize going trying to plan Apollo when you’ve just had Alan Sheppard’s Mercury Flight is kind of impossible. At the same time, I’ve seen enough “collect all the efforts in work and call it The Plan” presentations to be bored by them. But, asking these kinds of questions leads to Gemini and other great things. I think the first question will be, does the Trump admin. buy the “The Deep Space Gateway we were building for Obama’s l‘The Journey to Mars’ now = your ‘Return to the Moon’” argument NASA will present them? Space program Laughing Stock alone makes this plan more than ridiculous. 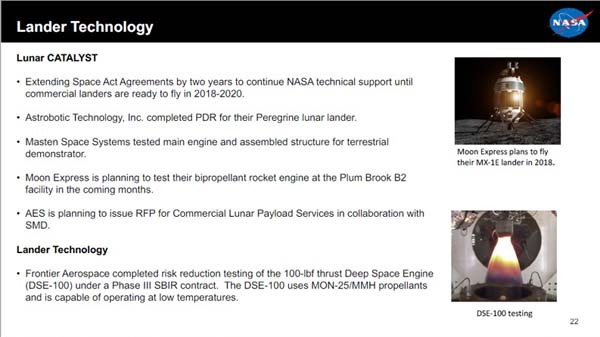 CATALYST is actually a semi COTS lunar lander program, the real wrench in the works is SLS, everything else or some modification thereof is feasible provided a different Launch vehicle, heck if you have to have a substantial payload penalty to get to or near TLI with a full first stage recovery Falcon Heavy, for cargo, do it it’s more viable than SLS, of course the RLV that will be out in the next 5 years that really is good for BEO (and GEO) is New Glenn, though it will never compete for LEO and MEO and FH in fully expendable configuration is a really substitute for SLS. 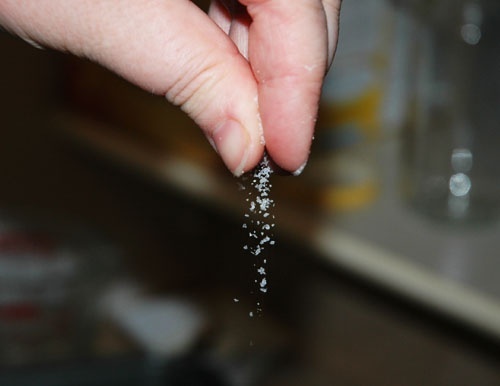 Is that salt, or cocaine? More like local Space. The furtherest away galaxy imaged is about 12 billion LY. Now that is deep Space. I guess they think there will never be any star-ships and the Solar system is deep space. Then congress should have passed his ORIGINAL budget proposal for NASA which called for 6 billion in new funding to fully fund commercial crew and which would be flying now.. New Engines for the atlas V to replace the russian enigines, which would be flying now. A fuel depot in LEO which would already be being tested. And a boat load of tech .. all killed by republicans… Well not all republicans. “Despite the shrieks you might have heard from a few special interests, the Obama administration’s budget for the National Aeronautics and Space Administration deserves strong approval from Republicans. The 2011 spending plan for the space agency does what is obvious to anyone who cares about man’s future in space and what presidential commissions have been recommending for nearly a decade. 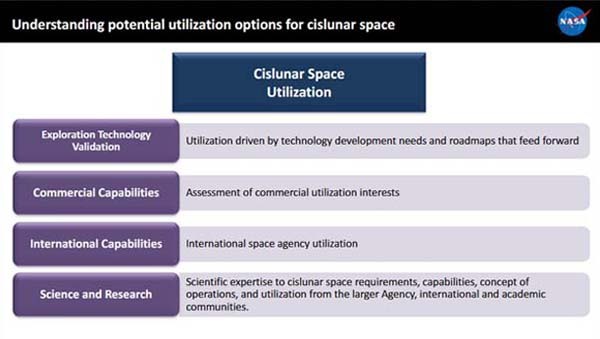 The Commission on the Future of the United States Aerospace Industry in 2002 suggested that greater commercial activity in space was the proper way forward. The Aldridge Commission of 2004, headed by former Secretary of the Air Force Edward C. “Pete” Aldridge, made clear that the only way NASA could achieve success with President George W. Bush’s Vision for Space Exploration was to expand the space enterprise with greater use of commercial assets. Most recently, the Augustine Commission, headed by Norman R. Augustine, former chief executive of Lockheed Martin, made clear that commercial providers of space-launch services were a necessary part of maintaining space leadership for the United States. People want to hate on Obama’s treatment of NASA because all they see is that Shuttle ended on his watch and he canceled Constellation, Shuttle was going to end regardless, it was a victim of compromises, they might have been able to push it a couple more years, but it just didn’t make sense at the time especially with the financial situation, Constellation was ended because it was the old way of doing things that only a proxy-war could really sustain, no proxy war, no one will want to fund it, and it was suffocating a far more viable way forward for the future, one that created jobs rather than simply maintaining existing jobs, renewed a major American export and reduced the strategic reliance on an import from a country that isn’t exactly a strong ally and our relationships with said country’s current government have always been tenuous at best. Blaming President Obama for the shuttle is like trying to blame Nixon for shutting down Apollo. The decision had already been made by President Bush. Once He said the shuttle was retiring all the parts needed to fly the remaining missions were built and the dies and jigs were destroyed and the companies changed the parts lines to building other things. By the time Obama took office the shuttle was dead. Wayne Hale wrote a piece explaining this and how it could not have been resurrected unless billions were spent by a congress that refused to spend it. They also try and blame him for Constellation…. another dumb proposition. Well, Asteroid Redirect is a pipe dream. The ground work for such mission needed a bunch of probes and observation crafts to visit and ID NEO/space rocks. Did NASA/Obama launch anything to them rocks in those 8 yrs?